Happy Memorial Day everyone. Here's to the wonderful service men and women past and present. Happy New Year everyone. I hope this is a healthy and prosperous year for all of us. Here are my 10 for 2010. Learn Corel Painter. I have no idea where this will lead but I am feeling like I need to explore this program. Pursue writing again. I really let this go by the wayside in 2009. 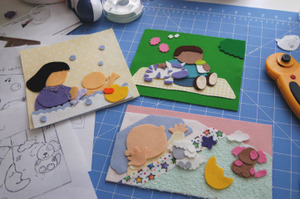 I know my dream is to write and illustrate my own books so I need to work towards that. 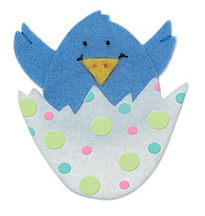 Make time for more crafting/decorating/gardening. Slow down and listen to that little voice. Be a more active blogger. Just be without putting too much pressure on myself. Finally shed these dumb 10 pounds! This is a terrible phone photo but I knew if I moved, I'd wake her. Here's Lily napping by the tree. She loves big stuffed animals and often uses them like a pacifier to put herself to sleep. There's a hedgehog about the same size that Santa will be bringing her this year. And so the countdown begins! This is my favorite time of year and I want to savor every moment of it. Christmas day always comes too fast. If you are a Twilight fan you will enjoy it, they stayed true to the book again which is always great. What made the first movie really work for me was the soundtrack so I was praying they'd pull it off again with this one, and they did for the most part. Not as much of a moody, ethereal style that appealed to me in the first but enough to make me want to get the soundtrack. Anyway, it was a fun girls day out for sure!!!! * OH! Don't know if any of you have read, "The Lovely Bones" but I was so surprised and excited to see that it has been made into a movie (they showed previews today). I enjoyed the book -except one area that I thought was totally unnecessary and took away from the story for me personally- but I'm hoping they'll omit it from the film version. Have you noticed how we have completely skipped over Thanksgiving and are already on the countdown to Christmas? It's crazy but I have to admit all the subliminal (and not so subliminal) advertising is working because I've already started my wish list. I thought I'd share what is on the top. I tried this at Brookstone last weekend and just fell in love with it. It massages your neck and shoulders and really hits the spot. It's called the , Ineed neck and shoulders massager. I didn't want to take it off. Kevin wanted me to get it but I balked at the price and asked for it for my Christmas gift. But now I regret it because I don't know if I can wait that long! Anyway, I just wanted to share in case you are looking for gift ideas. Brookstone is in our local mall and maybe it's in yours as well. If so, go in and give it a try. That's not me but that was definitely my expression when I had it on. Took myself to a movie today and finally saw the film above. Oh, I loved it, loved it, loved it. I was fascinated by the back story of the infamous Julia Childs (Meryl Streep - BRAVO!) while equally enjoying the trials and tribs of the Julie of today(Amy Adams- delightful!). I connected with both -I think you all will too - finding themselves and pursuing publication. Anyway, I'm no critic, just enjoyed the film thoroughly. Okay, so if you go see the movie and get excited by the fried bread and tomato scene, here is a link to the recipe. You'll know what I mean when you see the film. Home again, home again! Returned late last night from our two week vacation visiting my parents in Las Vegas. It was so nice to see them and revisit our favorite places. For me, simple things like going to the movies at my local casino/cinema (most cinemas are built attached to casinos now). We also splurged and stayed 4 nights at the Venetian. SOO fun! If you visit Vegas, I would highly recommend this hotel. Fun pools, shopping, shows and great food. Plus, it's adjoined with the Palazzo so can use their pools as well as the one's at the Venetian. We stayed at the Palazzo for a couple of nights when we lived in LV and it's gorgeous. Either way, try to get a room with a view of the city. Worth the extra cash. Happy Friday to all. I thought I'd share my girls and what they've been up to this week. First the "good girl", who is doing what she loves best. Sorry Val, didn't mean to wake you with the flash. Then here is little bit showing off her new trick. This morning she is trying to cute me to death so she won't get in trouble for digging. Did you all catch the Oscars last night? I have to admit, I hadn't seen ,"Slumdog Millionaire", so I didn't know what all the buzz was about. I wish I had because I would have been just as caught up in the thrill of their wins as everyone else. I finally watched it today and for me it lived up to all the hype. I absolutely loved it. The wins were well deserving. See it if you can. It's a lovely story full of humor, love, sadness, action...everything. Last year my theme for 2008 was trust and I'm not sure how well I honored it. Often, I questioned myself and what was going on around me. The move, assignments (I stink, I'll never get another assignment- negative self talk) family issues, etc. You know, nothing earth shattering, just life. Having said that, I am proud of myself for finally pursuing digital illustration - something I've wanted to do for years. I know I'm on the right track simply because I'm feeling satisfied. I'm having fun. When you're where you are meant to be there is a peace about it. Do you know what I mean? Even if you're not exactly there yet but working towards it, you can feel it, can't you? And it feels good. So that's what I want for this year. 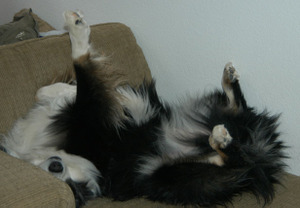 My 2009 theme is contentment (dictionary definition: satisfied, ease of mind). I want to do my best at staying in this feeling because it's truly wonderful. 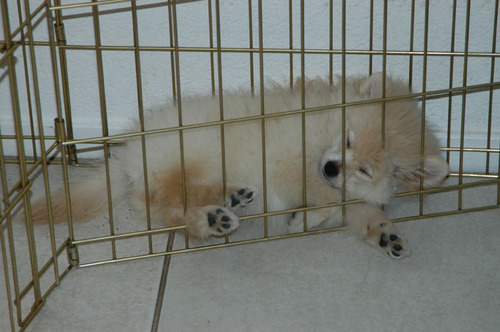 Stress is exhausting. I don't want assignments or lack of assignments to define my happiness as much as it has in the past, that's for sure. Goals? Just to keep creating, growing and exploring. Here's to a 2009 full of wonderful possibilities for all of us! Merry Christmas Eve to everyone! 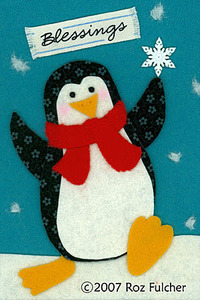 I hope you all have a wonderful holiday celebration with family and friends. xo to all. Every winter I get the urge to crochet and this year is no different. This time last year I was coveting this scarf and I've been wanting to make one ever since. A little ambitious so I decided to do something simple to get the ball rolling (or should I say unraveling?). I chose a traditional granny square and had Emily choose 3 colors that she'd like for her scarf. I have really enjoyed working on this in the evenings. So relaxing. .She wants a very long scarf so I have quite a few blocks to go. My goal is twenty. Then I'll "block" and join. I'll be sure to post the finished version if all goes well. The scarf grew into a hat and embellished gloves. Emily was very happy with it and it was a ton of fun to make. We are home in Illinois! It's our first time in the midwest and it sure is a lovely part of the U.S.A.
My baby is growing up. He just passed his driving test! Here he is with Kevin and my dad who went with him to the test. Jess- we are so proud of you! This week the movers will be here packing our things and we'll be out of our house this weekend. Can't believe it's here already. Please use this temporary email address if you need to reach me. Thanks! Emily has been asking to see "Phantom of the Opera" for a couple of years now so this weekend I surprised her with a girls night out at the Venetian to see it for her 12th birthday. She absolutely loved it and I would highly recommend it to anyone visiting that is looking for a show to attend. The music and constumes were fabulous. This is something I'm really going to miss when we leave...the shows. This week my babies started back to school. Every year Kevin and I say the same thing, "Remember Emily's first year of school when we took a picture of them together?" Then we laugh and laugh. To be fair, Kevvy (left) has made a transition over the past couple of years and thankfully looks forward to going and does well with switching teachers. I am so grateful for this because it hasn't always been the case. This gives me so much peace about our move to Illinois, I know he'll do fine. Hope everyone is having a wonderful summer so far. Balancing deadlines while enjoying summer fun is making time whiz by here in the desert. Remember when I shared the news that we were being assigned to New Mexico? Well, we found out a couple of weeks ago that the assignment was denied. 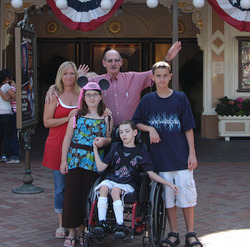 The base medical team cannot accommodate Kevin's (our son with CP) medical needs. We were surprised and disappointed and have been on pins and needles waiting to see where we would land next. As of yesterday, it looks like they may not be moving us after all and the mister will transition to a position here. The kids were thrilled with this but I'm not convinced until we see something in writing. I feel a little like this boy who is springing back and forth, back and forth. Here's a reminder of when she was only a few months old. Time flies. Hope everyone had a lovely Christmas!. My parents are here and the kids don't go back to school until the 7th of January so I'm still caught up in the cocoon of family time. But I did want to make time and wish you all a very happy new year. I hope this year brings us all good health, prosperity and great experiences with our loved ones and friends. Blessings to all of you this Christmas. Today is Emily's 11th birthday. No more kiddos in Elementary school now. <sniff> When did they start growing so quickly? Last night my parents drove in from New Mexico (12 hours away) for a surprise visit to celebrate. 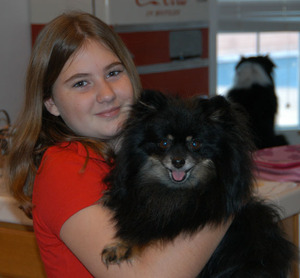 Emily is holding their pom, Brittany, who actually has the same birth date. She is 7 years old today. I didn't realize she was going through the 'uglies'. When I first picked her out she was a fluff ball with lots of hair on her face. 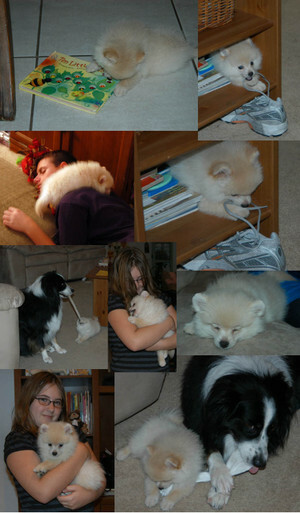 When she was able to come home at 9 weeks, it looked like the breeder had trimmed her muzzle and eyes. I asked her why she had done it and she assured me she hadn't. It's part of the growth process. They call it "monkey face" but I think she looks more like a cute hedgehog than a monkey. House training is coming along. She will "go" outside but teaching her to ask to go out is proving a challenge. I was spoiled with Valentine who has only had one accident in the nearly four years that we've had her. I'm not exaggerating! I didn't get her until 16 weeks old, though. I think that made a big difference. They are doing great together! I love how much they play and I can tell that Val really enjoys her company. She does let her know when she's had enough of her hyper puppy-ness but I think she shows a lot of patience with this little fireball. Val you are such a good girl! How can that be comfortable? The kids are officially back to school this week and we are all trying to adjust to the new schedule. Three kids in three different schools and times...ack! Here's the new member of our family, Lily. 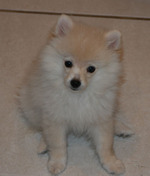 She is a 10 week cream pomeranian. If she were brown , she'd look like a hedgehog. She is as sweet as can be...but a maniac! I have tried to get pictures of her when she shoves her head into Valentine's mouth or hangs off of her chest hair. Unreal! Valentine is being so patient with this little thing that thinks she is the size of a doberman. Say cheese Everyone! Umm, where's mum? Oh wait, we're still missing someone. We're back from our week in California and I'm not quite ready to be off vacation. Had such a great time and having my parents with us this year was such a great treat! Although, I think Valentine is happy to be out of the Kennels. 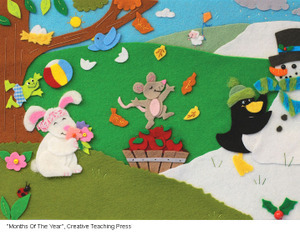 This week is "Teacher Appreciation Week" and I want to recommend a gift. 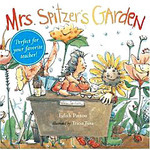 It's "Mrs. Spitzer's Garden" by Edith Pattou, illustrated by the talented Tricia Tusa. Mrs. Spitzer is a wise teacher who knows many things. She knows about gardens. She knows about children. She knows how similar they are. And how they will flourish if tended lovingly. Emily and Kevvy gave this to their teachers this week. I had them tape a school picture of themselves on the front end paper with a personal message to their teacher. If you can't get this in time for "teacher appreciation" then consider it for the end of the school year. Your childs teacher will LOVE it. Yesterday was "take your child to work day". Emily and Jesse stayed home with me to experience the day of a freelancer. I had Jesse (nearly 15yrs) work on his 7 page essay that's due on Monday (since he hasn't started the blasted thing!) and Emily (10 yrs) was assigned a one page magazine poem to illustrate. I provided her with the poem with its layout and after she finished her sketch she decided what medium she wanted to work in. I figured she'd want to work with watercolor and colored pencils (it's her favorite) but I think the stash of papers I've been collecting was calling her name. YAY, Emily! I love it. 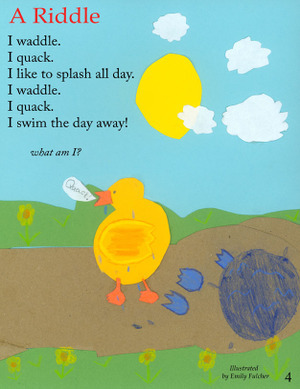 I especially love the wet feet marks and how she decided to show the duck waddling away AFTER his swim. I would have gone a different way and I like her idea MUCH better. 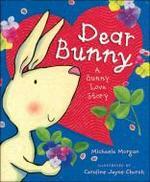 In the end the mice recreate the papers into a new love letter and the bunnies find out how the other feels. It's just such a cute "happily ever after" story , check it out. 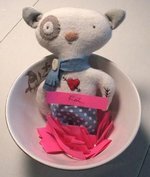 And I have to say a Happy Valentines Day to me, because I just found out that my name was drawn over at Sweet Pea's blog. I am the winner of "Sparky" who will be coming to live with me in Vegas. YAY!! 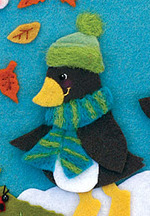 As well as being a talented illustrator, Susan also enjoys creating "softies" in her not so spare time. Cyber hugs & chocolate to all that visit the ol' blog today. I wanted to share a couple of finds with you before the New Year catches up with us. Both are such wonderful ways to absorb yourself in the spirit of giving. Please take time to read both, they are well worth it and will inspire you for next year. First is the "Little White Envelope". Although this story has been around since the 1980's it was new to me when I read it on, "readable feast". 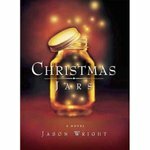 "Christmas Jars", by Jason F. Wright. It's a quick read that you can enjoy in an evening sitting. Lovely. Oh boy, it's getting crazy with anticipation around here with Christmas drawing near. There will be some last minute shopping when family flies in over the weekend but for the most part I think I'm ready. I know the kids are! Good gravy, are they ready. Speaking of kids, I realized that I shared pictures of Emily but not the rest of my wonderful gang these past couple of posts. Here is Emily, Jesse and Kevvy. 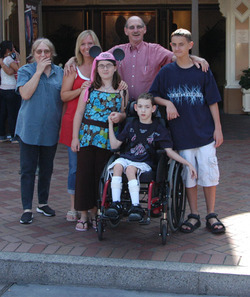 (Kevvy has severe cerebral palsy. He loves to laugh and teaches us daily what not to take for granted.) And that's me attempting to keep Valentine in the picture before the timer goes off! This picture was taken for my husband who is currently deployed overseas. It is our first year ever that "daddy" won't be home for Christmas. It's very hard, but as much as we are missing him and counting the days 'til he's home, we are equally proud of him too. Please keep him and all military members that are serving overseas in your prayers. On behalf of my husband, I'd like to say a public thank you to friends, family and strangers that have sent care packages, letters and goodies to those deployed overseas. It does not go unappreciated and truly helps the morale of these brave men and women who are so far away from home. Again, thank you from the bottom of my heart. However, I have found that I'm more caught up in a world of hdc's, yo's and sc's this year. Nan's knitted slippers were dubbed "Arthurs" (short for arthritis) and she was so proud of this that she knitted everyone a pair of their own each year from then on. 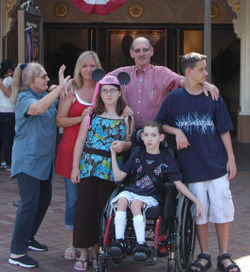 When my dear Nan passed away in 2004 she took with her this cherished family tradition. Last year, I wanted to surprise my mum by making a pair for Christmas so I got knitting needles and yarn. I failed miserably and only managed to share with her my wish to make them for her. Fast forward to this Thanksgiving when she visited and brought with her a pattern for crocheted slippers that looked very similar to the knitted ones Nan used to make. EUREKA! Crochet, I can do. 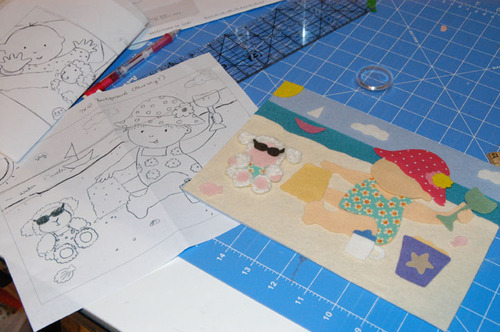 After some trial and error, adaptations and playing around, I have a pattern for Arthurs! Here is Emily in the prototype. So here I am,feverishly making Arthurs every evening for my immediate family and I think my Nan would be pleased. I know I am. Christmas is absolutely , my most favorite time of year and I'm happy to say we started celebrating immediately on Thanksgiving day by putting up and decorating the tree. Last year, we had just moved in to our house and it was hard to decorate surrounded by boxes. We have some new additions this year! Here is an ornament that I treated myself to this week. His name is Fred and he flew over from Snowbears workshop. Adorable. I hope she continues to make these , I'd love to build a collection. And another sparkly treasure is my new drummer boy who arrived yesterday as a gift from an equally treasured friend. Isn't he cute? While my mum has been visiting, she has been teaching my Emily to sew. Mum cut the pieces and Em did all the sewing. 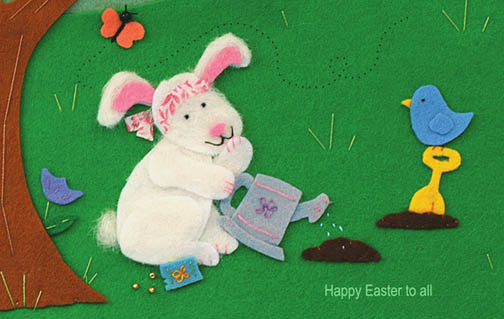 I just love it, look at the bunny. Too cute! Well done, sweet girl. 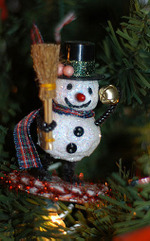 Emily's snowman sits with the ornament she made when she was 5 (she's 10 now). 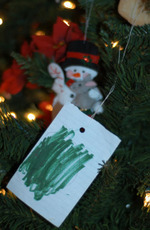 Yep, it still goes on the tree every year. The same year this paper ornament was made, she would draw pictures, wrap them, put them under the tree labeled, "To: Emily From: Emily". Christmas morning she'd rip it open yelling, "Oh I wonder what it could be!" There has been a lot of baking and crafting for the tree, compliments of Emily again..
Oh I do love my Christmas tree. Awww, the kids went back to school this week and I have to admit, it is so wonderful to have the house to myself again. This summer flew by in a blink and as far as my freelance work , I was the busiest I have ever been. Believe me, I'm not complaining but it was a major challenge trying to juggle home life, children and a freelance schedule. Balance? Nope, not even close. If you're an aspiring illustrator you're probably thinking - like I did when I read posts like this - "what a nice problem to have!". And it is, it really is. I hope that the work continues to come in. I'm so grateful to be doing something I love. But I learned this summer, that I need a game plan. I need to get more organized with my time if I want to maintain some semblance of balance. The two main things I scratched out of my daily routine were pretty basic, water and exercise. Not good. And boy did my body let me know that I wasn't being kind to it. You can only live on highly caffeinated diet drinks for so long. So I'm feeling like I do in January. It's a new school year, time for a fresh start. In my mind I know the solution is simple, "just do it". Similar to deadlines, you get them done because you said you will and your career depends on it. Well, I need to treat my personal goals with the same respect and discipline. Just do it. I feel so much better on the days that I do, why can't I remember that? I toast my water bottle to all my family, friends and fellow freelancers. Here's to a fresh school year and my game plan. 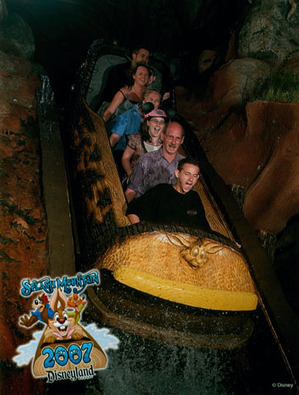 Sorry to be so quiet but the family and I took a much needed vacation last week to Disneyland. Yay, what a wonderful time we had! 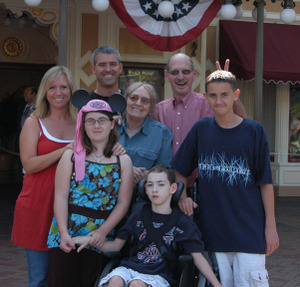 I spent 7 years of my childhood living in California and Disneyland was my favorite place in the world. It still is. And what a treat to take my own children there for the first time and see them have such a great time. I won't bore you with family photos but I will share with you one of the highlights of the trip for me. Hubby surprised me with an early Christmas gift when we visited the watch shop on "Main Street". I adore Eeyore and fell in love with this the minute I saw it. What is most exciting , when you purchase your time piece you also receive the original artwork used to make your watch. Unfortunately I missed meeting Dave but took a picture of Eric Scales who was working on a lovely Daisy duck illustration. I could have sat and watched him work for hours. 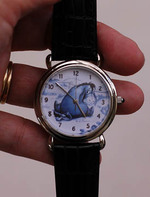 I will cherish my eeyore watch for years to come! In loving memory of my father in law, "Pops". We are going to miss you so much. Thanks Loobylu for the cool link!